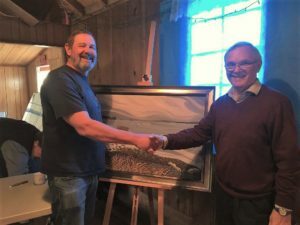 Don Castleden, Chair of the Estuary Working Group (on right) presents the Keeping it Living Award to Wayne White, President of the Tsolum River Restoration Society at their AGM on Feb. 18, 2017. The non-profit stewardship group Project Watershed has been focused on the long-term health of the K’ómoks Estuary since 2008. The Society’s mission is public education and information coupled with habitat restoration and research. In 2010, the Society’s Estuary Working Group developed its “Keeping it Living” mission statement for the Estuary. The slogan is based on First Nations’ principles of sustainability. A beautiful painting of the Estuary, by local artist Bev Byerley, was purchased and donated to the Society and each year this painting is displayed by the award recipient – a local organization whose behaviour most closely embodies the philosophy of the Estuary Working Group’s mission statement indicates Board Chair Paul Horgen. In the past the award has been presented to four of the five governments bordering the estuary, a number of local stewardship groups, and last year was awarded to the Royston Elementary School and its students who participated in a massive shoreline restoration effort near the Royston wrecks. The Estuary Working Group has recommended that the Tsolum River Restoration Society be the recipient for the 2016 award. A copper mine operated in the headwaters of the Tsolum River for a few years in the 1960s and the toxic acid drainage from this mine effectively killed the Tsolum and its associated salmon runs. In 1997 Project Watershed administered funding for the Tsolum River Task Force to start work on restoring the river. 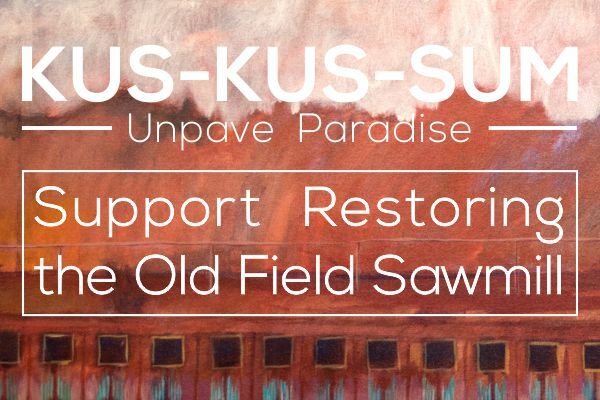 The following year the Tsolum River Restoration Society was formed and they made several costly attempts to rehabilitate and restore the Tsolum, eventually showing signs of success in 2003 and further success when the mine was capped off in 2008. In 2016 the Tsolum River Restoration Society completed a significant piece of work – the Tsolum River Recovery Plan which identifies a set of priorities that are intended to further the recovery of the watershed and its fish socks. Recently the Tsolum had numerous naturally returning Pink salmon to the river to spawn, and the copper pollution residues in the river continue to decline. This is an amazing success story for a river that had been declared officially dead. Historically, the spawning areas along the river and its’ small tributaries were main destinations along the salmon highway which passes through the K’ómoks Estuary, and it looks like this will become a reality again comments Don Castleden, Chair of the Estuary Working Group. 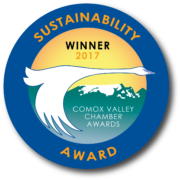 Both Societies share space in the Conservation Centre located at 2356a Rosewall Cres., in Tin Town, Courtenay.